Nothing screams good old-fashioned bar food like a glorious platter of nachos soaked in cheese. 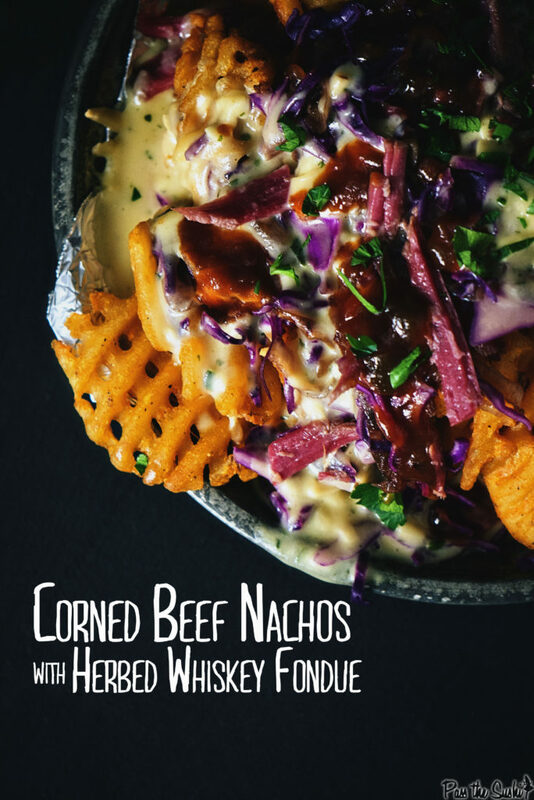 Now, image Corned Beef Nachos with Herbed Whiskey Fondue. Bring happy hour home. Got some corned beef leftovers laying around? Corned beef, although popularized by St Patty’s Day menus everywhere, isn’t actually a traditional Irish dish at all. It was more used as a bacon substitute when times were tight in the early 1900’s. Corned beef is actually a beef cut that has been salt cured. That’s why it can be cooked low and slow for hours and retain a ton of flavor and it’s signature pink colour. Where corned beef is a term for the curing process of the beef, the cut doesn’t technically have to be any one in particular but is often the fatty brisket. Which, explains why it’s important to watch the local market adverts. I mean, cuz corned beef was on sale recently and I know I stocked up. Corned beef leftovers shouldn’t have to wait for St. Patty to bust out the godforsaken green beer, it should be an all year long sort of thing. So, yeah, I have a leftover corned beef stash just ready and waiting for weak moments like this. Weak moments that result in glorious piles of waffle-cut fries bathing in a herbed stout fondue. 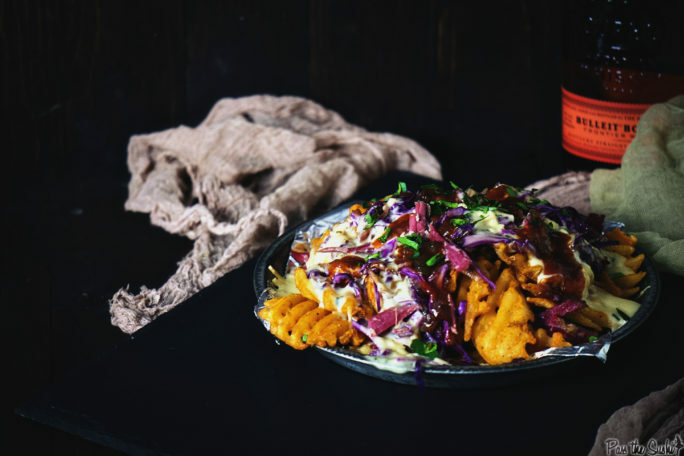 If you DON’T have corned beef stockpiled, let me give you some inspiration (besides these nachos) to make you run to the market right now…. The classic corned beef and cabbage (seriously, once a year, this is amazing). Think about homemade pastrami…. yep. Homemade Pastrami. And then there’s piled high Corned Beef Sandwiches, Rueben hot dogs and more. Now, Corned Beef Nachos with Herbed Whiskey Fondue. Yeah, you read that right. 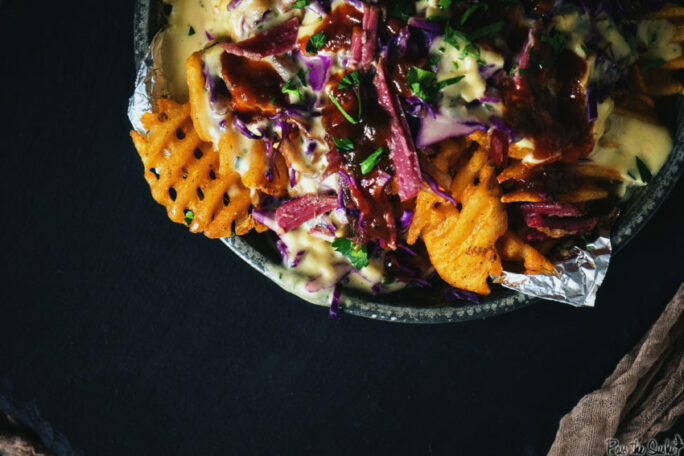 If you’ve tried my Corned Beef Nachos with Herbed Whiskey Fondue recipe, or any other recipe on GirlCarnivore.com please don’t forget to rate the recipe and let me know where you found it in the comments below. I get inspired by your feedback and comments! You can also FOLLOW ME on Instagram@girlcarnivore as well as on Twitter and Facebook. Prepare the waffle fries according to directions on package. Meanwhile, whisk the whiskey, honey, and brown sugar in a small saucepan. Bring to a boil; reduce heat to a simmer and allow to reduce. Toss in the sliced onions and allow to simmer on low until soft, 8 to 10 minutes. In a saucepan over medium heat, melt the butter and flour and cook for 3 to 4 minutes. Stir in the whiskey. Add the cheese a little at a time, the milk, and the Dijon. Stir until melted. Keep heated over low until ready to use. 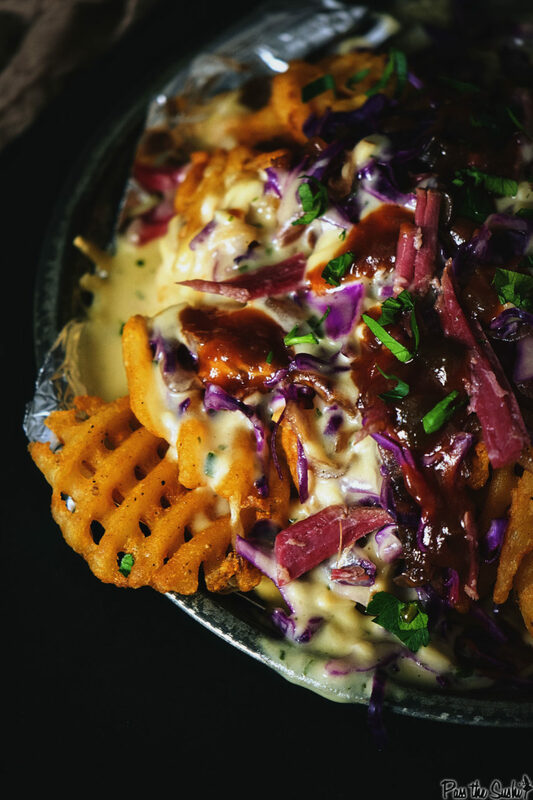 Toss the corned beef with the onions in the whiskey sauce and arrange over the cooked waffle fries in layers. Stir any remaining sauce into the cheese sauce. Pour over the fries, being sure to give a little pool at the bottom for dipping. Top with cabbage, sprinkle with remaining cheese and toast under the broiler until everything is melted. I need to buy more corned beef! I need to be stuffing my face with these right now! These nachos look amazing! That whiskey fondue sounds awesome!! I may be drooling over these at 7 am…this WILL go down tonight!